Peachy Yutangco-Daye originally turned to gluten-free baked products out of compassion for her customers. It ended up becoming the best business decision she ever made. Since it opened almost seven years ago, Organic Oven built its reputation among a loyal and ever-expanding customer base; back then, many of them were frustrated members of a “niche market,” with special dietary restrictions because of celiac disease (gluten intolerance) who simply wanted to be able to eat baked goods suitable for their diet without sacrificing taste. Knowing that there was a definite market and trend for organic foods that catered to allergies or gluten intolerance, Yutangco-Daye decided to invest everything she had to make it work. Now people as far away as the United States have made the trek to the Brampton store and bakery at 31 Melanie Drive, which uses premium ingredients such as whole-wheat flour and rice milk. All their products are milk-free and nut-free. Customers often approached her with a list of allergies, she says, which inspired her and her daughter, Precious, to experiment with ingredients such as spelt and kamut, before they realized that gluten-free garnered a more popular reception. Yutangco-Daye clearly has a keen business sense, so it’s not surprising that Organic Oven was not her first venture. She owned a popular bakery that sold whole-wheat breads in Manila, Philippines, before immigrating with her daughter to Canada in 1995. The next few years were a series of highs and lows for Yutangco-Daye and her daughter: working for minimum wage, getting laid off, until she enrolled in a government-sponsored mentorship program that prepared her with the skills to run Organic Oven. Of all these challenges, the scariest for Yutangco-Daye was the financial risk of starting up a business; it was only last year when she started to make a small profit. “Those moments were scary, really, really scary,” says Yutangco-Daye, her voice momentarily faltering. “It’s almost like I put everything into it, all my time. Probably once a week, I would do an all-nighter. We cannot afford help — Precious and I had to work all the hours that we can. Yutangco-Daye says she managed to survive thanks to miracle after miracle — she didn’t have any capital, but somehow friends showed up just in time to offer money without even being asked. This year, she says, she could afford to send them small cheques. 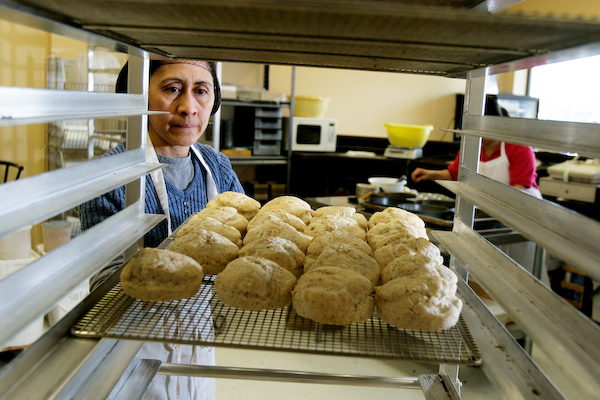 In 2005, Organic Oven won the Brampton Outstanding Business Achievement Award. And the company’s future remains bright, with plans for new retail locations in downtown Toronto. It seems Yutangco-Daye and her thriving business will have no problem rising to the top. Here are two special ingredients to help you start up your business. Build networks with other professionals in your field Sponsored by Employment Ontario, the Newcomer Professionals at Work program offers opportunities in paid internships, mentorship, employment and one-on-one professional counselling. Successful applicants may have eight to 12 weeks for internships or four months of mentorship. skillsforchange.org/npw/index.html.